They can let people into your space or keep strangers at bay. They can insulate your home and be incredibly decorative. Doors are just as important as windows in letting light into your home and keeping out unwanted weather and elements. Your front door adds curb appeal and can be the centerpiece of the exterior of your home. However, you want it to be as secure as it is beautiful. Wyeth Woodworking and Remodeling will help you choose the right material for your patio and front doors as well as interior French and paneled doors. For instance, glass adds a bit of elegance and comes in many different styles, which can reflect your style and recent trends. Create colorful panels or use tinted glass. Wood tends to warp, rot and split in a front door. However, fiberglass and steel may be more secure and durable, lasting the duration of your home’s life. Aluminum and vinyl are also strong and are great materials for patio and exterior doors. Protect your house from the elements with weather-stripping and a snug frame. 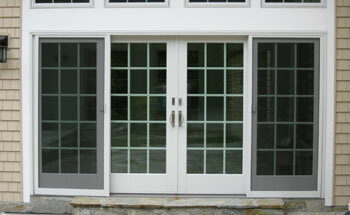 Your utility bills can be much lower in part because of the quality of the doors in your home. French doors can separate the rooms in your house and separate a patio from the interior of your home. They can connect a sunroom to a family room or kitchen, and serve as a timeless classic in decorative home architecture. If you want to save space, a classic sliding glass door may be perfect for your home. Wyeth guarantees the quality and performance of the doors within your home. Keeping within your budget and helping to keep your future energy bills low, Wyeth Woodworking and Remodeling has the window and door contractors that can offer you the most durable and weatherproofed materials as well as the most pleasing grilles, transoms and decorative glass. We’ll help keep your home as low maintenance as possible, if that is what you so desire. Don’t pick any door when it goes into your home—trust Wyeth to help you pick the doors that will open to your friends and family and close to bad weather and high bills.